Downwind sailing has never been easier or more fun! The Doyle APC has opened up a whole new realm of simple, fun-filled sailing with an easy to set and fly asymmetrical spinnaker. Dousing it is easy and trouble free with the ATN Spinnaker Sleeve. The APC is designed specifically for the cruising sailor. It is slightly smaller in overall dimensions than the racing APR 90, but has the same attributes. The even entry allows easier trimming and stabilizes the sail. A flatter leech creates less backwind for better reaching. The longer luff gives the sail more drawing power, and gets more area out in front of the mainsail. This is very effective in the 100-130 degree apparent wind angles. The shorter leech allows the sail to be more easily trimmed on all points of sail. The APC is a stable, powerful sail that will improve your offwind performance. Its unique geometry, combined with an aerodynamic cross sectional shape, allows the sail to fly out away from the boat in undisturbed air. This applies more force on the boat and increases your downwind capability. The ATN Spinnaker Sleeve is carefully designed to ensure it does not foul the spinnaker when setting or dousing the sail. The control lines run in their own pockets separate from the sail itself, and consequently cannot get tangled. The sock is made from a loosely woven "slippery" material for friction free usage. This sail is the link between headsails and spinnakers, with a wider usable wind range than either. It sets and furls on its own luff rope and furler. It cannot collapse like a Spinnaker. Effective wind range 33-180 degrees AWA. Triangles make very inefficient airfoils. Elliptical shapes reduce the energy robbing tip vortices. This is why aeroplane wings, propellers and even keels are always elliptical rather than triangular in form. It is also why high roach mains are so much more efficient than mains with little or no roach. The same is true for headsails. As a result, the racing rules limit or prohibit it. When sailing hard on the wind the jib and main work almost as one, and thus the combined elliptical profile determines the aerodynamic efficiency. When eased off, or reaching, the sails act more independently and the geometry of each is critical to performance. The sail designers at Doyle have developed shaping techniques that support critical roach area in headsails without the need for battens so you can enjoy the efficiency of an elliptical form and have a sail that can be easily furled! Thus, not only does the Doyle UPS provide more area for light air and for off the wind sailing it provides much greater efficiency! 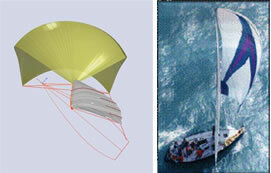 The All Purpose Full Radial Spinnaker is designed to be used at 80 - 140 degrees AWA and up to 15 knots AWS. 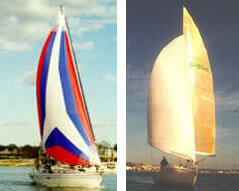 This sail is designed to be the work horse of any inventory and covers a large range. It has fuller girths and is designed to lift and fly away from the boat. The top 10% of the sail being flatter allows the spinnaker to set away from the rig before the body of the sail curves down. The result is a sail that flies out to windward, away from the disturbed air of the mainsail and rig, in clear air flow.